DD™ Trick-or-treat Tote Bag Giveaway! Dunkin’ Donuts has created a whole new Halloween menu. 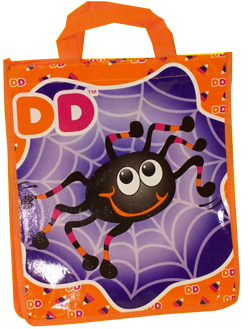 And to promote their Spooktacular Halloween Treats they have introduced a Trick-or-treat bag promotion. The colorful and attractive tote bags are being given out free with a 50-piece donut hole purchase. They are so hot that they are being sold on eBay! These tote bags will prove to be a successful promotion. They are great for the kids, they are reusable and they generate excitement around the brand. Custom Tote Bags offer a wide range of imprint possibilities. They have large imprint areas that can be screen printed, printed with a 4-color process or embroidered. Garrett Specialties offers a large variety of inexpensive to high quality totes. Choose a tote bag for your next advertisement and create a lasing impression! Read more about the DD™ promo here. These are adorable. I can see why they are a hot, trendy item. Imagine the talk drummed up about your own business if you handed these out.